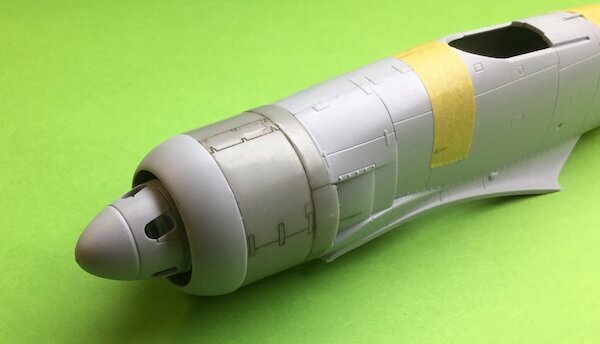 However there is an error made by Airfix as the cowling split line between the upper and lower access doors is in the incorrect place. The upper door should be slightly smaller and therefore the line moves up by about 2mm, this has been verified by photographs and drawings and cross checked by Steve Long who has access to a Sea Fury in Australia. Basically Airfix have the panel line in line with exhaust 3 from the bottom and it should be between 4 and 5 from the top. Note the new resin casting is as it is but a wash as run into the panels for clarity.